The 42-year-old Italian has not managed a club side before and has still to obtain the Uefa Pro Licence. "I know I am not the most experienced manager, but I have ideas and have been involved in football for 20 years," he said after signing a three-year deal. "It's a great opportunity and I am sure I can do a great job for this club." West Ham have agreed with the Premier League that Zola, who already has Uefa's B licence, can work as a manager as long as he gains the Uefa Pro Licence by 2010. There have been reports that Zola wants Chelsea assistant Steve Clarke, who coached him at Stamford Bridge, to be his number two at Upton Park. He did not confirm this, but said that Antonio Pintus would be coming in as a fitness coach, while caretaker manager Kevin Keen would remain part of the club's coaching staff. Can Zola defy the sceptics and get the backing of Hammers fans? Keen will take charge of West Ham for Saturday's Premiership match at West Brom, so Zola's first match in charge will be against Newcastle at home on 20 September. Pintus used to work at Chelsea, as well as at Monaco and Juventus. Zola played for Chelsea from 1996 to 2003 and has been voted the club's greatest-ever player by their fans. The two clubs have an intense rivalry, yet Zola insisted this would not be a problem. He said: "I had seven wonderful years with Chelsea and it's something I will never forget. But here I have the opportunity of another experience, as a manager. "I hope it will be as good as those seven years were. What is important is the present and this club that has faith in me. "I am totally focused on what I am doing here with West Ham. The club has got tradition and I am just here to help develop the team and to develop the players. "That is my duty and I will do it with all of myself. I will give to these players all of my experience and all of my knowledge - I am here to be somebody good for them." Zola, who is West Ham's fifth manager in seven years and their first foreign boss, was an instinctive and lavishly gifted forward. He promised to also have an attacking philosophy now he is a manager. "My philosophy is to play offensive football if I can," he said. "I have always done that, because I trust it. "We have to make it enjoyable for the players first and then for the crowd and everybody. "Obviously we will have to be a balanced team, but the philosophy will be to play offensive football." 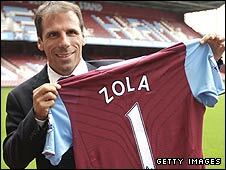 Zola succeeds Alan Curbishley, who resigned last Wednesday because a lack of control over the club's transfer policy. Technical director Gianluca Nani had been mainly responsible for which players were bought and sold at the end of Curbishley's reign. Zola thanked Nani for "backing me" and said he had "no problem" working with his compatriot. He said: "My work is on the pitch, my first duty is to develop the team. The director is working with me, not against me. "I said to the board that everyone has to work together as a team. We will try to do things together for the good of the club." And the Italian paid tribute to his predecessor. "I believe Curbishley has done a great job here and I respect him very much," he said. 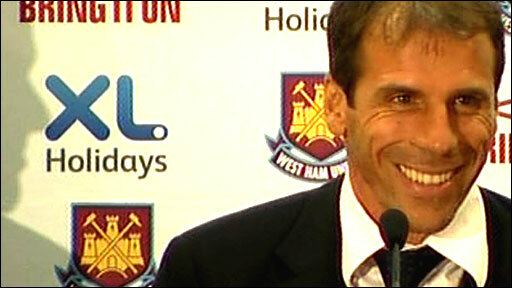 Chief executive Scott Duxbury said Zola had been the board's "unanimous choice" to be their new manager.